Soak the boiled rice and all the dals together for an hour along with the red chillies. Drain the water and grind them into a coarse batter while adding salt. Now that the batter is ready, add freshly chopped coconut pieces, curry leaves,whole pepper and asafoetida to this. Mix well. Fry the vadas in oil and serve with any chutney or sauce of your choice. 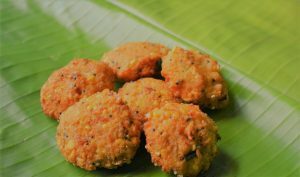 The crunchy vadas with whole pieces of coconut and pepper make a good evening snack. I tried coriander chutney with this and it tasted great. You can add a twist to this recipe by giving a tadka (seasoning) of mustard seeds and hing(asafoetida) to the batter before frying. Every pack is from a single organic farm.